Indians and Americans often find it difficult to understand the other nation’s strategic worldview, let alone agree with it. There is little question that this dissonance applies to the highest levels of government leadership in both nations, giving each side a very cynical view of the other’s intentions not only in relation to one another, but most foreign policy actions. A chasm exists across a wide array of decision making areas. Nowhere is this more evident than in how the United States and India have reacted to recent conflicts that have grabbed global attention: Russia’s incursion into Crimea, Syria’s civil war, Iran’s nuclear quest, and Sri Lanka’s human rights abuses. In every case, the American government led by Barack Obama has taken a hard stance, though indeed not hard enough for many Americans’ tastes, while the Indian government has chafed at American rhetoric, while diverging on United Nations votes and arguing publicly over decision points. It does not seem to matter which party is in power in either country. These disagreements, while quite real and even serious are certainly not enough to derail the diplomatic, commercial and military exchanges between the two nations. After all, no two nations including strong democracies have the exact same interests. On the other hand, they are enough to cause a hindrance on both sides- and prevent the two nations from working more closely together. Below, we will analyze the differing viewpoints on the Crimea conflict, and do so in a neutral way- which is a hallmark of usindiamonitor. We’ll also try and find a path toward a mutually acceptable middle ground (good luck with that!). Crimea. Trilateral relationships are fascinating in the same way that love triangles are. The United States and India have very different relationships with all third party countries, and nowhere is this more pronounced than when it comes to Russia. India was born almost exactly when the Cold War started, in 1947. From the beginning, India’s leadership was determined not to overtly take sides in this ongoing set of power plays between the world’s two superpowers. During the period from 1947 to 1991, which is the time that most historians would agree was the Cold War’s life span, India was doggedly “non-aligned.” While clearly a capitalist democracy from the outset, India’s governance was based heavily on socialist principles and identity politics. For most of that time, Washington was kept close and Moscow was kept closer, while in the literal sense Russia was and is closer physically. The Cold War is now long over, and India has taken a decidedly more pro-Western and pro-capitalist tack since 1991- by no coincidence the time frame when the Cold War came to a close. Yet India has maintained close ties with Russia throughout. Being “non-aligned” means a lot less these days, but it is a principle that India’s foreign policy establishment continues to hold on to. And it is a rational policy to trade with both or buy weapons from both. One bulwark of the Indo-Russian relationship is India’s dire need for external energy resources, which it imports from the petro-state Russia in high volumes. The other is high-level military cooperation: joint exercises, collaboration in counter-terrorism, arms sales, and joint development of weaponry at a far higher level with Russians than with anyone else. And Russians do love them some Bollywood too. So while India believes in stability in the Ukraine, not least because of the tens of thousands of Indians studying or working there, it does not share America’s desire to impose sanctions or other punitive measures to get Russia to stand down. India has in fact backed Moscow during this crisis, showing empathy for a territorial dispute with glaring parallels to the one in Kashmir. The United States meanwhile views Russia’s incursion into Crimea as a direct affront against its allies nearby, and as a test of Western muscle, both diplomatic and military. When India decided not to vote for sanctions at the UN or to shut Russia out of multilateral conclaves, it was a disappointment to Washington. The United States does not have enough interests in the Ukraine to take military action against Russia, but it is acutely aware of the perceived diminished role in world affairs- a symbolic area where India could be of vital assistance. Subsequently, the United States feels a burden both internally and internationally to play a morally based role in maintaining stability abroad, especially when the aggressor is somewhat of a nemesis. India’s divergent policy on this front is viewed in American circles as an inability by India to see the larger picture: India is an aspiring world power, and should start acting like one, taking the high road in response to threats to global order. But in this attitude, Indians see nothing but hypocrisy from the United States. What about the brutal American invasions of Iraq, Afghanistan, and Libya, or threats to bomb Syria? Or the NSA’s data mining practices? Where was America’s staunch defense of sovereignty principles then? The Realities. The divergent world views of the United States and India of course are not just based on principles or even interests. Much also depends on the reality of where each nation is in its lifespan. While India is a young and energetic country clearly growing in terms of global clout, riding a trajectory that should make it a superpower within decades, it does not have the ability to project military power outside of its neighborhood yet. While Indians are settled in virtually every part of the world in large numbers, including Ukraine, India does not have the ability to affect military outcomes in any conflict outside of South Asia. Nor will it anytime soon. It does not see itself as a world police force as America sees itself- nor does India have the volume of sea lanes, airspace, army bases, supply lines, and infrastructure around the world to protect that America does. This has shaped India’s posture toward non-interference in other countries’ affairs outside of Pakistan, Afghanistan, or Sri Lanka. In a similar vein, India does not have enough economic clout to affect outcomes abroad either. In fact, most any sanction regime that India joins is more likely to harm India’s economy than that of the intended target, as India is heavily dependent on trade in order to maintain GDP growth. It simply cannot afford to forego energy imports from Russia, Iran, and Syria as easily as the United States can. It cannot afford to forego the steady stream of remittances from Indian workers in those countries either. Indian firms in IT and other fields also do brisk business in these places. The United States cannot provide enough offsets to make up for all of it even if it tried. The United States, on the other hand does possess the ability to at least involve itself in every major conflict around the world, with capacity to spare. However, the problem is that these interjections have often proved ineffective and unpopular. The United States has been in violent conflict in Afghanistan since 2003, and the reviews of its performance are mixed at best. The country has proven adept at military adventures, but struggles mightily with political problem solving in the aftermath. One cost of Iraq and Afghanistan to America is a largely diminished appetite for managing foreign conflicts. Any leader dragging the country into a new conflict zone is certain not to enjoy the backing of a majority of Americans and their representatives in Washington- with the glaring exception of a response to an attack on the American homeland. America is war-weary these days. The focus is on pulling out, not pushing in. In this current reality, the United States needs partners to arrive at diplomatic solutions. More damaging than disagreements with India are those with European nations, who sit closer to Ukraine and possess more relevant resources, but have proven unwilling to use military or economic threats in dealing with Russia. Looking Ahead. Where does all of this leave us? We are entering a new era with just one world military superpower loathe to go to war that will need to flex its diplomatic muscles to achieve its vision of what the world should look like. America has a long way to go in this regard, the largest hurdle being American leaders’ lack of empathy and understanding of other nations’ postures, especially when force is off the table and the sticks and carrots are not as powerful as they once were. In fairness, it is not an easy transition to make, especially when anti-US sentiment remains high. This comes back to India, which isn’t in position to do much militarily, but is eager to exercise its diplomatic power more. A constant theme I read about is how Indians feel slighted by Americans. There is a confluence of interests here, as both India and the United States want to come up with diplomatic solutions to conflicts. Hopefully they will learn to do so in tandem. A little bit of empathy between the two would go a long way. If the United States were to be more empathetic towards India’s positions, rather than demanding cooperation even when this cooperation is deemed by Americans to be morally right or in the best interests of global harmony, I believe Indian leaders would be more receptive. The United States can be of great assistance in terms of economic rewards for cooperation, such as increasing visas or development aid. Indians want to feel that they are equals on the global stage arriving at collaborative decisions. This was not helped by the lingering bitterness over how Devyani Khobragade was treated, a situation that could have been handled better by both sides. India is often in a tough position. Many analysts say its decisions on UN votes are “between a rock and a hard place,” such as when members vote against Russia or Sri Lanka. If India adopted a hard line in those cases, it would struggle to afford the consequences. However, India for its part has a responsibility to start thinking of world affairs from a global perspective, or as I like to say, start punching its weight. Respect on the world stage is earned by difficult decisions with difficult consequences. The United States makes these decisions all the time, but has had a head start of many decades and far more resources to cope with them. And so we conclude with a few open-ended questions. 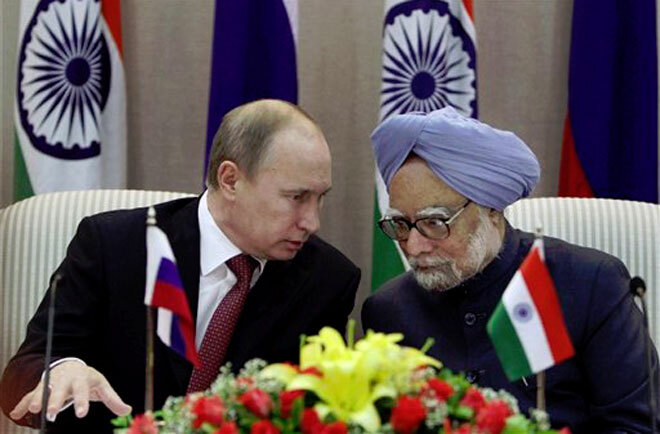 Is India doing all that it possibly can to use its good offices with Moscow to de-escalate the conflict in Ukraine? Is India willing to bump heads with its ally over the right thing to do? Can India avoid using US pressure to do something as an excuse not to do it? And can America for its part, ease up on it and view India not as a vassal, but a partner? I continue to believe the US-India nexus could form the backbone of a new world order of peace and prosperity for all of mankind. The shared values are there, as are the shared interests. India’s clout is growing just as America needs it the most. Much of the differences covered today are transitory, based on recent history. The future is not yet written, and may just provide an opportunity to write the next, better chapter. Posted on April 22, 2014, in Politics/Diplomacy, Security. Bookmark the permalink. Leave a comment.